The Predator Triton 900 takes a few notes from Acer's earlier convertibles. A few years ago, Acer gave us an intriguing twist on the convertible PC, the Aspire R14, which featured an easel-like hinge that rotated the screen. Now it's bringing that feature, which Acer calls the Ezel hinge, to a gaming laptop: Say hello to the Predator Triton 900. The company only gave us a brief glimpse at the device (it was protected by a glass case), but it looks like the screen will rotate just like the Aspire R14. You'll be able to twist it all the way around for a tent-like formation or lay it flat. The Triton 900 will also feature the latest version of the company's Aeroblade cooling technology. It looks like having a bit of space underneath the monitor will help with cooling too. 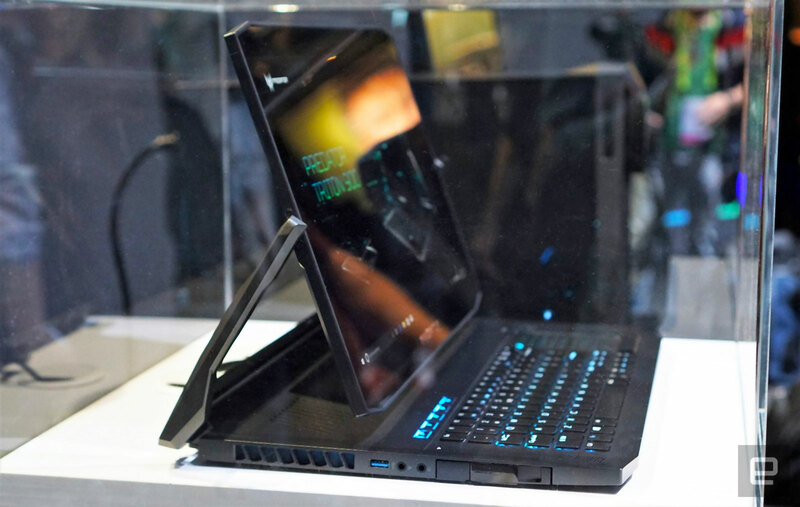 Unfortunately, Acer didn't have many details to share about the Predator Triton 900. A rep told us it'll be powered by the latest NVIDIA laptop graphics, which makes us think we won't see this machine until NVIDIA's 20-series GPUs make it to notebooks. There aren't any pricing or availability details yet, but we're hoping Acer gets it ready in time for CES.